Holly Graves won six golds. Holly Graves was in fine form for City of Peterborough Swimming Club (COPS) when they took the Hatfield Open Qualifier meet by storm. They had 29 swimmers in action, all bidding to gain East Region and GB Championshiop qualification times, and they returned with a magnificent haul of 39 medals - 14 of them gold. Matthew Rothwell won three golds. Star of the COPS show at the Hertfordshire Sports Village was 13 year-old Holly Graves with a double hat-trick of gold medals. She won the 50m, 200m and 400m freestyle, 100m and 200m backstroke and the 200m individual medley. She also claimed a bronze medal in the 200m breaststroke. Top performing boy for COPS at this meet was Matthew Rothwell (15). He won three gold medals - in the 100m breaststroke and individual medley and the 200m freestyle - and topped up his tally with three silver medals - in the 50m freestyle, 100m fly and 200m breaststroke. 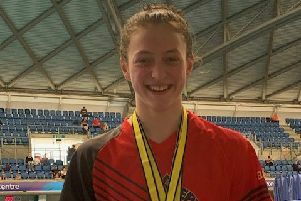 COPS other gold medallists were Ella McGhie (13), who won the 400m individual medley and a silver in the 400m free and a bronze in the 200m free; George Whiteman (13), who took gold in the 400m free and a bronze in the 200m free and 400m individual medley; Sophie Griffin (13), who won the 100m fly; Amy Paget (12), who struck gold in the 400m individual medley; and Charlotte Shaw (10), who won the 400m individual medley. COPS other medal winners were: James Rothwell (13) silver - 100m individual medley 200m free, bronze - 100m free and fly; Erivan Shilani (13) silver - 50m and 100m backstroke; Matthew Newson (14) silver - 400m free and individual medley, bronze - 50m breaststroke and fly; Jessica Mahoney (12) silver - 200m back, bronze - 50m backstroke; Lauren Browne (14) silver - 100m fly; Eve Burks (13) silver - 100m backstroke; Stan Scarborough (11) silver - 400m free; Mark Goodes (13) bronze - 200m backstroke and Safford Hewitt-White (11) bronze - 400m freestyle. Also swimming for COPS were: Charlie Ardern (13), Sam Ardern (11), Cameron Fisher (14), Keiran Griffin (11), Joshua Martin (11), Ella Normington (11), Bert Papworth (12), Jess Shaw (12), Josh Smith (12), Joshua Spencer (12), Katie Tasker (14), Jemima Tuffnell (12) and Mia Turvey (11).